Mumbai Magic Scratch Card Guide & Review - Casino Answers! Mumbai Magic is an instant win scratch card game from Microgaming. It can be played at Wild Jack Casino and Nostalgia Casino. 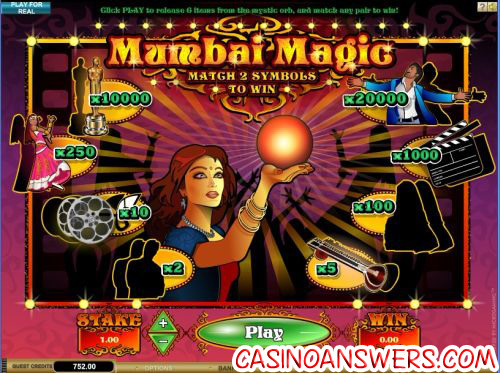 Mumbai Magic is not a traditional online casino scratch card game. Instead of scratching, you place your bet, hit the “Play” button and 6 items will pop out of a mystic orb. If you match two objects, you will win. To play Mumbai Magic, you must first set a bet. Bets on Mumbai Magic are $0.50, $1, $2, $3, $4, $5, $6, $7, $8, $9 and $10. Once you have chosen your bet value, you can hit the “Play” button and the game will begin. You can win up to a 20,000X jackpot on Mumbai Magic. This means that if you stake $10 on a game of Mumbai Magic, you can win up to $200,000. All you have to do is match two Bollywood actor symbols. Other possible wins are 2X, 5X, 10X, 100X, 250X, 1000X and 10,000X. All you have to do is match two of any symbol to win any of these prizes. For its top jackpot of 20,000X your bet, Mumbai Magic is definitely worth a few plays. You never know, you could get that magical win! You can get a 100% up to $100 signup bonus plus 10% cashback on deposits which could total up to $3,000 per year at Wild Jack Casino. Can players in the United States play Mumbai Magic for real money? Microgaming currently does not allow players from the United States of America. However, US players can play the many different online scratch card games at Cherry Red Casino. How do I play Mumbai Magic? To play Mumbai Magic, simply set your bet value and hit “Play.” Six items will then come out of the orb. If two of them match, you will win a prize! What is the most I can win while playing Mumbai Magic? Players can win up to 20,000 times their bet playing Mumbai Magic. If a players bets $10 and wins the top prize, that player will win the top prize of $200,000! Where can I play scratch cards for free online? What is a fun online casino game scratch card?